Sewing machine, scissors, pins, measuring tape, seam ripper, iron, ironing board, marking tools, and a white clean cotton cloth and distilled water for pressing. If you plan to sew for yourself, a dress form would be highly recommended. All the details on dress forms below. Supplies would include: Fabric, interfacing, thread, trims, elastic, and other items needed for a specific project. 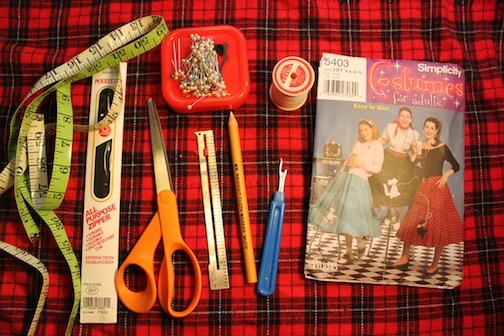 The photo below shows the tools used in the making of a skirt. In this example a Poodle Skirt pattern, without the felt and the Poodle. 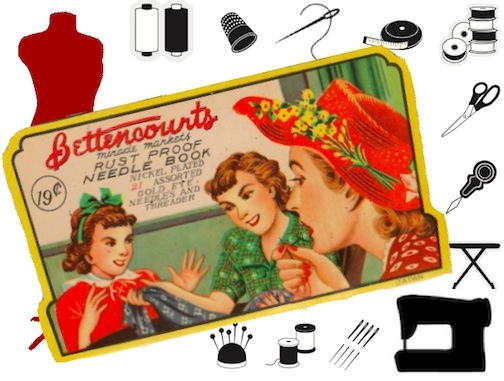 Most beginner sewing projects will seldom need more than what is pictured here. Sewing Machine Demo The most important thing is a sewing machine that works. If you already own a sewing machine, and it works, then learn with that. If it works, but you don't know how to use it, or it has problems, then you may need to seek out the company that makes the machine for help, or find a manual on line. 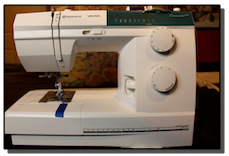 If you outgrow it, go to a sewing store that sells machines and learn about the current options. I purchased the sewing machine pictured here, which is a Viking Emerald 122/118/116 (Husqvarna). This machine is about $340 and can handle heavy fabric, like coats, leather, etc. If you're planning to sew heavy things eventually, and are looking for a new sewing machine in this price range, then this is the best thing going in my opinion. So far i've had no problems. Try and get a machine that does not have a lot of plastic parts. I went through two $99 Singers in the last couple of years. I tried to sew fleece and leather, and it was too much for it. I decided not to put more money into fixing those machines, and upgraded to a machine that would handle almost everything. Used Sewing Machines: I've heard of some great deals on used machines. As low as $25 US, depending on the machine. I've seen $20 sewing machines at thrift stores. Ask the clerk to plug it in for you to make sure it works. Make sure it has all the necessary parts and a manual ideally. If it doesn't have a manual, you may want to check the internet and see if you can download it. Also check online, and visit a sewing machine store so you can can idea of what's on the market and how it compares. Decide what's necessary for you, then go forward from there. Scissors - All purpose medium size scissor to start. If money is not an obstacle, there are some very fun, cool sewing scissors out there. Label them with "Sewing Scissors Only". Hide them from others, and do not use them for anything but fabric. Not even paper. If you do, you'll end up buying pair after pair, or dealing with dull scissors that can mess up your fabric. You can also sharpen your scissors. Pins - Make sure your pins are not rusty, dull or bent. Use the proper pins for delicate fabrics like silk or sheer. For most projects the cute all purpose pearl tip pins are my preference. If they're dull you may end up frustrated over and over when trying to do a simple task like pinning, not to mention the unnecessary holes they create in the fabric, so examine those old pins you may have inherited from grandma. Marking Tool - I like the disappearing ink marking pen because it's precise and the ink really is easy to remove. Just dab a touch of water on the ink, then blot it off with a dry cloth. There are many options that work. Pencils, carbon, and chalk are some of the other options. Chalk is also a favorite of many. Personally I don't care for the pencil because it doesn't mark the fabric as easily, but it's cheap and always there. Some of the other options like the pin are great, but if you run out in the middle of a project and you don't have back up, your done. A sewing gauge, cloth measuring tape and a yardstick would be a good start. The sewing gauge can be set with your measurement and used repeatedly with little trouble. Great for hems and many other uses. The measuring tape is going to be necessary for body measurements, and I use the yardstick on the table along side the fabric, or from floor to hemline for hemming measurements. Seam Ripper - A necessary tool to rip out stitches. Not only for ripping out mistakes, but also ripping out temporary basting stitches. Cardboard Sewing Table - Costs appx. $20. I use this one because it's large enough to handle most projects. I also like that I can hold things down with push pins. The most important thing is keeping the fabric measurements accurate. When laying out the fabric it's important to keep it square, so pinning down the edges of the fabric along straight lines help to get accurate measurements, and therefore a better finished product. It's also light and easy to move around, and can be folded to store easily. 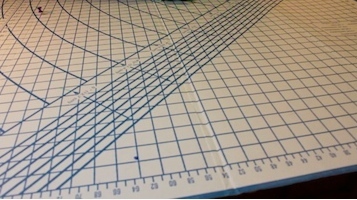 There are many options on sewing surfaces. If you're just learning, and are on a budget, this is a good option, but examine the other options before deciding what's best for you. Eventually you may want to have several types of surfaces for different projects. Back to "Free Sewing Instructions"